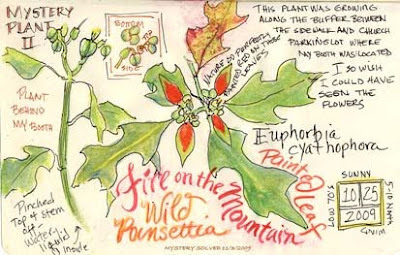 South Carolina LowCountry Nature Journaling and Art: Fire on the Mountain - Mystery Solved! Fire on the Mountain - Mystery Solved! Behind my booth at the Bluffton Arts & Seafood Festival I discovered a plant I'd not seen before. I was struck by Nature's red brushstrokes within the green leaves. So much of the plant reminded me of a poinsettia but then not. 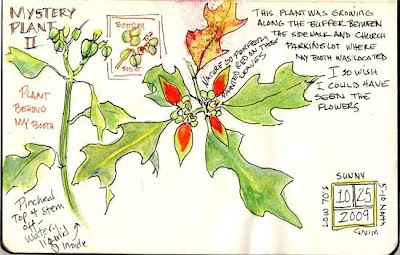 I posted this initial sketch on Flickr and asked if anyone had any idea what this plant was called. Several flickr friends said poinsettia. I search all my books, but to no avail. I wanted to know this poinsettia like plant's latin name. John Nelson of the University of South Carolina's Department of Biological Sciences came to the rescue. 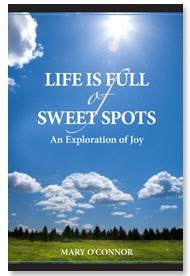 I sent him my initial sketch and a couple of photographs I took. I so love it when a mystery can be solved! Thank you, John!! Really nice illustration Pam. How fun to find a new plant! very nice and lively journal pages!